If you are not making coffee the modern way, you are wasting a lot of time, money, and coffee. The K-Cup compatible pod coffee maker is the modern way to make coffee – it is fast, easy and costs just pennies per cup to craft a custom cup of coffee in less than even one minute. With an on demand or single serve coffee maker, which is what the pod style brewing systems are technically call, there is no need to scoop and measure coffee or deal with flimsy paper filters and messy coffee grounds. On demand, coffee makers don’t even use a coffee pot - they brew the fresh, hot, and flavorful coffee directly into your cup, glass, or mug so you will never again need to argue about whose turn it is to clean out the coffee pot or thermal carafe. When you brew coffee by the cup, you brew only what you need so waste is eliminated – there is no leftover coffee to toss out at the end of the day and that saves money. You also use less coffee because you brew less to begin with and since the on demand, coffee makers have no warming plate you will never again get stuck drinking scorched, bitter or stale coffee. 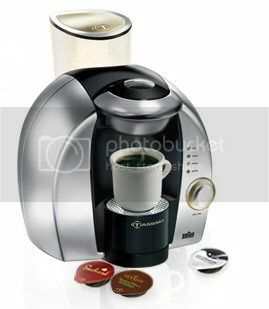 On demand coffee makers use coffee pods which are pre-measured and individually sealed; you can get all your favorite coffee like Starbucks®, Gloria Jean’s® K-Cup® style and more at http://www.bedbathandbeyond.com – a sampler pack makes it easy to try out all sorts of flavors, roasts and blends. With an on demand coffee maker, it is easy to switch back and forth between regular and decaffeinated coffee because each cup is individually brewed. That is indeed a one modern coffee maker. I would love to have something like that :) if budget permits. This looks really modern. The design is edgy and haven't seen one like this before. Its a single served coffee machine which is really stylish and definitely modern.